This TO&A Bristol Street Court Reporting Center is ready to provide all your litigation needs. Located in the South Coast Metro area in Orange County, just minutes from John Wayne Airport. 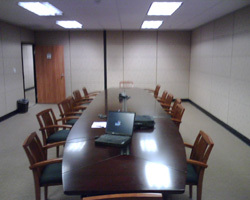 We offer fully furnished conference/deposition rooms equipped with state-of-the-art audiovisual technology, LCD projectors and high speed internet. We also have a conference phone system and projection capabilities, and our highly skilled onsite staff are ready to assist you with any professional and administrative support you may need.